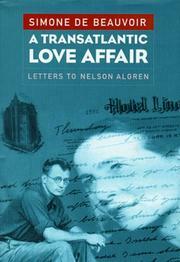 Another volume of Beauvoir’s correspondence to lay on the shelf beside Letters to Sartre (1991), this time featuring letters written to a most unlikely lover, the American novelist Nelson Algren. It would be hard to imagine two more discrepant writers (or temperaments) than Beauvoir and Algren, but when they met while she was touring the US in 1947, it was love at first sight. Neither knew much about the other when they were introduced in Algren’s beloved Chicago, but before she returned to Paris, they spent two frenzied weeks together in New York, connecting on an intensely visceral level. Beauvoir often referred to him as “my husband.” She wrote to him in English, sometimes berating him for his stubborn refusal to learn French. The letters in this volume offer a view of the existentialist and the French literary elite of the late ’40s and ’50s as Beauvoir gives Algren a Cook’s tour of her daily life. Readers glimpse the torrid political atmosphere in Paris during the Indochina conflict, with Sartre the recipient of death threats, and of the ruffian behavior of such literary lights as Arthur Koestler, depicted by de Beauvoir as belligerently anticommunist when drunk, apologetic but self-absorbed when sober. Felicities are many in this hefty compendium, ranging from Beauvoir’s encounter with “this ridiculous thing which is called Truman Capote” to an encomium on flying (“I think when you are at a high pitch of emotion, it is the only way of traveling which fits with your own heart”). Her occasionally fractured English is not without charm, but too much of the book consists of repetitively girlish affirmations of love that are odd coming from such a writer and thinker. Minimal notes and (apparently) almost no editorial intervention make this a hard slog for all but the most ardent Beauvoirians.